Is this Satan’s Throne? Is the Cathedra Petri really Peter’s seat or might it be something else? 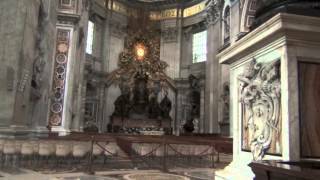 There is also a YouTube sermon about Vatican City, Peter, and this same throne shot in Rome and Vatican City: The Vatican, Peter, and ‘Satan’s Throne’. Joyce’s Photos of Rome, St. John’s Basilica, and the Vatican Rome has been a major world city for centuries. Since the late second century, it has made claims of prominence over Christianity. There is even a photo of what has been described as “Satan’s Throne” ( ) plus the Cathedra Romana. This entry was posted on Saturday, August 17th, 2013 at 12:01 am	and is filed under Church History, COG News, Doctrine.